Will the Olympic Torch Burn China? 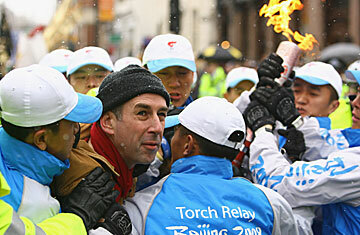 Police officers detain a demonstrator along the route of the Olympic torch relay in London, April 6, 2008. China is dealing with visible and invisible opposition in the months before the Beijing Olympics begin. The visible was front-and-center in the world media as the OIympic torch made its way through various countries on a circuitous route to the Games. Everywhere Chinese security is on guard against activists prepared to disrupt the flame's progress to protest China's human rights record in Tibet and in the enormous province of Xinjiang. In London, a protester tried to grab the flame away from its official bearer; at one point, the torch had to make its way through the city within the protective confines of a bus. Earlier, when the flame traveled through Istanbul, Turkish police arrested a man who made a move toward the torchbearer. And in Paris on Monday, officials actually took the step of extinguishing the torch amid protests. But it is the invisible opposition, what Beijing prevents the rest of the world from seeing, that elicits the most concern. Recent reports indicate that sporadic violence in Tibet continues despite a massive Chinese military crackdown that has now lasted almost three weeks. According to Tibetan exiles and activist groups, Chinese police on April 3 fired on monks from the Tongkor monastery in Ganzi, Sichuan Province, killing an unknown number. China's official Xinhua News Agency confirmed that disturbances had taken place but did not report any deaths. Meanwhile, in what is certainly a deeply worrying development for Beijing, the unrest has spread to other ethnic minority areas, the Chinese authorities confirmed, this time in the far western Muslim-dominated province of Xinjiang. As usual, accounts of what happened by overseas activists and the Chinese authorities were poles apart. But there is no doubt that significant unrest over Chinese rule has occurred in Xinjiang, involving hundreds and possibly thousands of protesters. There have also been roundups by security forces in which scores have been detained. The puzzle is what are the Communist Party cadres in Beijing feeling as they watch these events unfold ? Anger certainly. And worry about how the staging of the Olympic Games in August could be affected. But by all accounts, they have also been surprised, shocked at how resentment over Chinese rule has suddenly exploded, threatening to spoil what was supposed to be a positive, peaceful run-up to the Games. And therein lies something of a mystery. How could Chinese authorities have missed the potential for Tibetan violence? It was no secret that groups ranging from disaffected Tibetans to human rights activists would try and take advantage of the approaching Olympics to exercise some leverage for their causes when Beijing seemed most vulnerable. And yet, China's leaders appear to have been completely unprepared to respond to challenges with anything but brute force and harsh words. Indeed, if Beijing was caught flat-footed by the scale and scope of the Lhasa protests it has been equally unready to change its policies on the human rights front, despite knowing almost from the day the Games were awarded to Beijing in 2001 that hosting the Olympics would shine an increasingly bright spotlight on its dismal rights record. On April 3, activist Hu Jia was sentenced to three and a half years' imprisonment after being found guilty of "inciting subversion of state power." Prosecutors had advanced as evidence essays he wrote linking the staging of the Games with human rights, as well as interviews he gave on the issue with foreign reporters. Hu's sentence was the latest in a string of recent convictions and imprisoning of activists apparently designed to stifle even the slightest sign of dissent ahead of the Games. Even China's huge online population of some 230 million, which is often cited as the country's most powerful force for greater openness, has felt the heat. Thousands of websites have been shuttered while government controls and blocking of sites outside China has intensified significantly in recent months. As Irene Khan, Secretary General of Amnesty International put it in a report released on April 1, despite promises by both the International Olympic Committee and Chinese officials, "The crackdown... has deepened not lessened because of the Olympics."